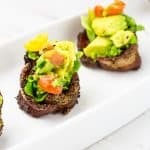 BLT Bacon Cups with Avocado - A Paleo Appetizer with Punch! 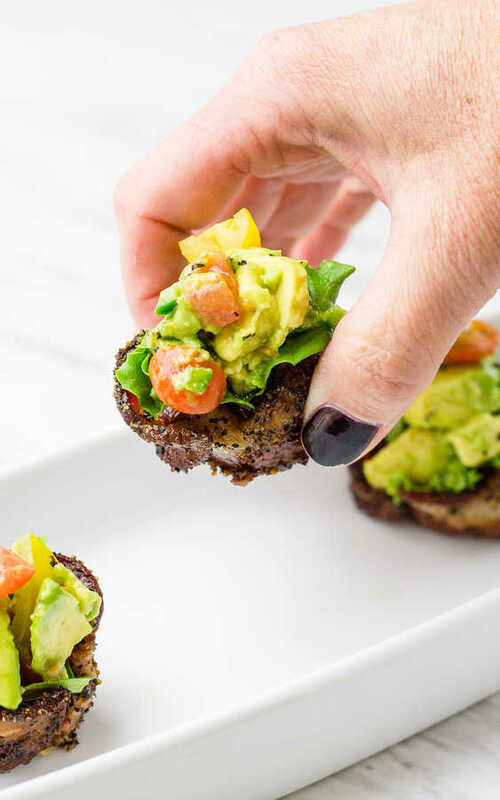 These bite-sized BLT Bacon Cups are a gluten-free version of a BLT but with the added creaminess of an avocado. Perfectly poppable and so delicious! BLT stands for Bacon, Lettuce, and Tomato. This is not fake news. The only way to improve on a BLT (in my opinion) is to add avocado. I saw this combo, although it was called a BLAT, and have been ordering BLTs with avocado ever since. It helps that I love avocados so if you don’t like them, or are allergic, then don’t eat them. On your BLT or anywhere else for that matter. I do love my BLTs with avocado but my favorite part of a BLT is, in fact, the BACON! I mean, isn’t this everyone’s favorite part? How do you make the perfect BLT? It all starts with white toast, not too brown and definitely not burnt, followed by a smear of mayonnaise on EACH piece of toast. If you only put mayo on one slice of toast then you are doing yourself a disservice!! Next, you layer the lettuce. This is a common mix-up as people want to put the bacon or the tomato next but these both have too much moisture and can make your perfectly toasted bread soggy before you can eat BLT. That is not a good way to eat! Lettuce on both pieces of toast to seal the mayo to the bread, protect the bacon from too much mayo, and to protect the bread from the juicy tomatoes. To finish the BLT off, place your ripe tomato slice and your crispy bacon in between the lettuce leaves. Top with the other lettuce and mayo smeared toast. There you have it, the perfect BLT! BLT Bacon Cups are not just for breakfast! I didn’t think you can improve on a BLT but Michelle over at West Via Midwest created a version of a BLT – WITH AVOCADO – that I am currently obsessed with. Before I tell you what it is, let me tell you how I found it. It’s Freaky Friday time again! 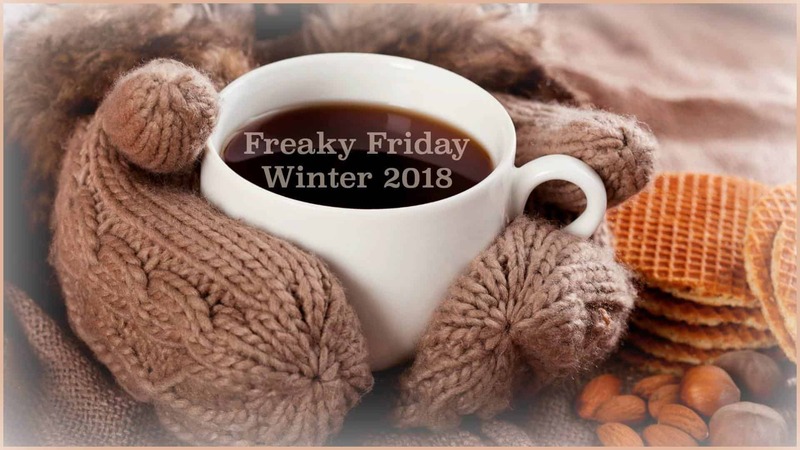 I have been participating in Freaky Friday for well over a year and I am so excited to FINALLY be paired with Michele’s Blog West Via Midwest. As part of the event, we get paired with another blogger via random draw so, like Forrest Gump’s box of chocolates, you never know who you are going to get. I got West via Midwest so I started scrolling through all of Michele’s recipes and stumbled upon her Guacamole BLT Bacon Cups. These are super-genius! Low carb, the bacon makes a tasty and crispy cup, and they are stuffed with guacamole. Hello, avocado on my BLT! 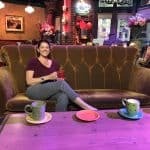 If you haven’t read Michele’s blog I encourage you to pop on over there pronto. Michele is a professionally trained chef, not the home-taught cook that I am, and she is a certified Sommelier! She is my both my hero and my spirit animal. Let’s get one thing straight right off the bat. 1. White wine pairs with fish/seafood and lighter dishes and red wine pairs with red meat. 2. It is cheap enough for me to feel like I am getting a bargain when I buy it or I have a coupon that is about to expire. Back to the BLT Bacon Cups. I decided to make the BLT Bacon cups like Michele’s but with two small changes. 1. Instead of making guacamole I just used lettuce and tomato and added diced avocado and a hint of jalapeno. Really like a chunky guacamole but with less time and effort. 2. I opted to go with peppered thick-cut bacon to add some more punch to the BLT cups. All of the fresh lettuce, tomatoes, and avocados need a little spice to balance them out. A BLT is not typically spicy but why not experiment a little? Michele not only experiments with BLTs with these nifty bacon cups, she also uses them to elevate quite a few dishes. Check out her Leftover Stuffing Bacon Cups, which also mentions a sweet potato casserole, Bacon Mac n Cheese Cups, and her Bacon Potato Nests. Thanks to Michele I now feel comfortable stuffing just about anything in a bacon cup. I might just throw in some of my Mexican Street Corn Salad next time! *Slice the avocado in half, moving around the pit inside. Separate the two halves. 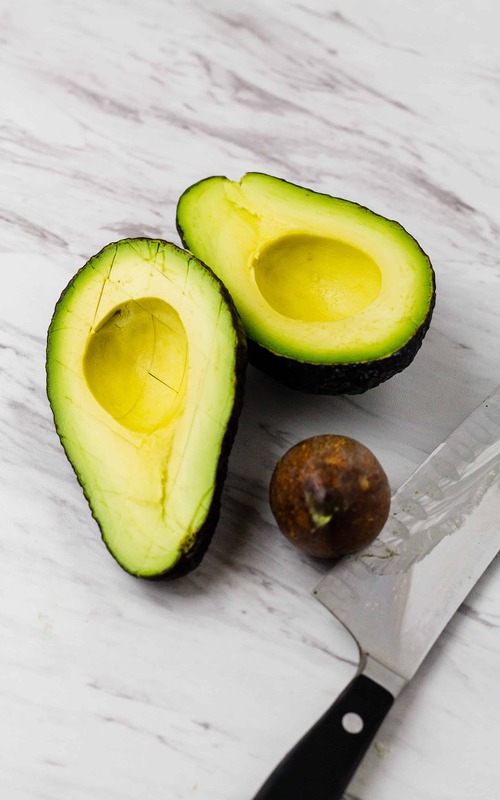 If you only need one half then leave the pit in the other and wrap it up, pressing the plastic wrap to the surface of the avocado. I like to use my Food Saver to do this as it removes all the air. You can also submerge the avocado in water to keep air off the cut surface and keep it from turning brown. The brown color comes from air reacting with the fruit (oxidizing) and makes it turn a yucky looking color even though it doesn’t affect the taste. *The half of the avocado that you ARE going to use we will dice inside the skin. I run my knife (VERY GENTLY) in a cross-hatch pattern through the avocado, being careful not to pierce the skin, and then scoop all the avocado with a big spoon. Perfectly diced avocado without getting your fingers all gooey. Tips for making the cups for the BLT Bacon cups. Use thick-cut bacon so the BLT Bacon cups aren’t thin and frail. You’re going to stuff the bacon cups with hearty ingredients so they better be able to hold up. Roll the bacon out a bit with a rolling pin to stretch it out. Bacon tends to shrink when you cook it and all the fat renders off it and you don’t want your cups to shrivel up to the size of a thimble. You won’t be able to stuff them. Cook the bacon until crispy. Adding fresh ingredients to the BLT Bacon cups adds moisture which leads to soggy appetizers. A few of my bacon cups did not completely “seal” at the bottom because of the bacon shifting while cooking, so to keep the moisture away for sure, I lined the bacon cups with a small leaf of lettuce. I’m putting lettuce in the BLT Bacon Cups anyway might as well use it to keep the bacon crispy. You can make the bacon cups the day before and store them in the refrigerator until ready to use. I did that for this recipe because of time-constraints with photographing the BLT Bacon cups. A quick reheat in the oven at 400F crisps the bacon cups back up and drains off even more fat. What would be your favorite filling to put in a Bacon Cup? 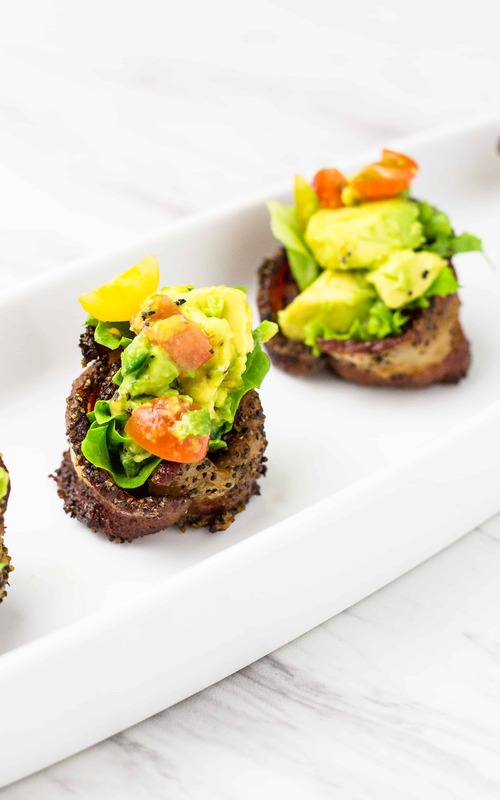 These BLT Bacon Cups are super fun with the avocado salad but have some many other possibilities! 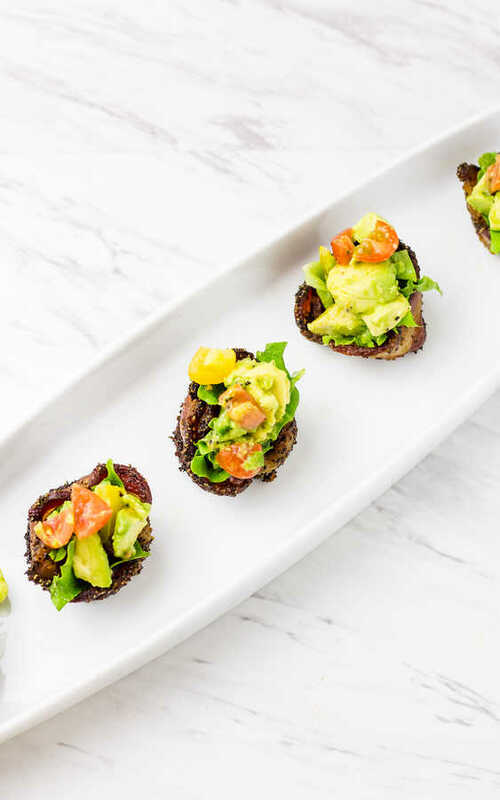 These bite-sized BLT Bacon Cups are a gluten-free version of a BLT but with the added creaminess of the avocado. Perfectly poppable and so delicious! Roll each slice of bacon o be ⅓ longer than it starts out as. The reason you buy thick cut bacon is that you need to roll out your bacon to make sure it is long enough to make a complete cup. Once the bacon is rolled out, cut each slice into 2 pieces. One piece that is 1/3 of the length, leaving a second piece that is 2/3 of the length. Wrap the long piece in a circle around the inside of muffin pan well making a circle around the sides. Place the smaller bacon piece in the bottom of the muffin well, pressing it down making a cup shape. Remove the bacon cups from the muffin pan, and allow to cool on a paper towel or parchment paper to drain a little. Cut the whole avocado in half and remove the pit. Cube the avocado in the skin and scoop out into a bowl. Add the tomatoes and jalapeno and toss to combine. Into each bacon cup, place a leaf of green leaf lettuce, covering the bottom and sealing any “cracks” in the bacon cup. Spoon 1 tablespoon avocado/tomato mixture into each bacon cup. Snap a picture and tag me on social media with #baconcups and @taketwotapas! I can’t wait to see your creations! Want to discover some new blogs and recipes that you will love? Check out this round of the Freaky Friday Blog Exchange. You know I love some bacon and these are a classier way to eat it! this is a genius idea—and so pretty, too! This is great! I never would have thought to add avocado to BLT! It looks awesome!!! I have one more avocado from my mom’s tree that will need to be used for this delicious looking appetizer! Yum! So full of flavor and yet so easy! Thanks for this awesome recipe! What an awesome appetizer! These would be such a hit at a party! Perfectly poppable…indeed! These look simply delicious, I’m a huge fan of all the ingredients…trying soon! There’s nothing better than a good BLT, but I really like this bite-sized option! And I love the fact that you used peppered bacon (my favorite)… It’s a nice way to add a little extra kick. Love the recipe, and all of the tips! Can’t wait to make them! These are definitely going on the menu when Dad is here. Since he’s low carb it would be perfect for him. And perfectly flavorful and delicious! My favorite thing? I think I am sold on the BLAT option. BLTs are my favorite sandwich on earth — so these are right up my alley!! Pretty much anything with bacon is a winner with me! And avocado…they are both staples in our house. It would be a very rare moment that I didn’t have bacon and avocado at the ready. So I can make this!! Mmmm….. I think my fav thing to put into the bacon cup would be exactly what you presented here. These sound over-the-top amazing and a real hit at any party I’m sure. Love this! I need to make these like asap!! 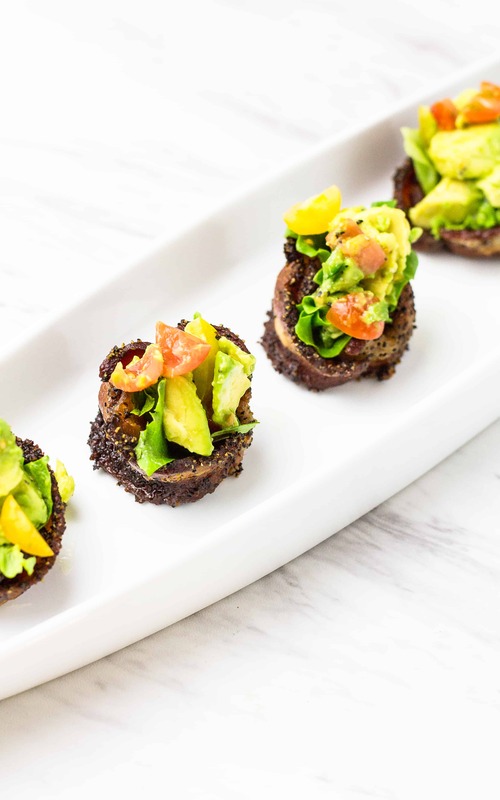 I love the added kick with the pepper crusted bacon and that creamy avocado.. these are bites of perfection!!! I’m super excited to try this. With a dang gluten allergy I’m always on the look out for fun alternatives to bread! These are genius! They would be a perfect party bite and I’m sure they would disappear in no time! These heavenly bites are right up my alley! I’m obsessed with everything avocado and bacon is my first love, so you know these are bookmarked, pinned and waiting to be devoured! p.s. Paloma cocktails are awesome! Truly, this is the most delicious recipe that I’ve seen all day. I’m looking at it while(drinking some cheap wine that seemed like a bargain), with dinner being eaten an hour ago and not really feeling any hunger. Until I came to this post. Ironically, I’ve been obsessing about avocado all day, even to the point where I was doing some down and dirty research on them. Maybe it’s because I picked up a bag of them last night that definitely were a good bargain! Who knows, but bacon with avocado, all in the form of a BLAT? I’m all in. This really looks incredible! I obsess about avocados too!! We should start a support group! I love that you like Bacon Cups almost as much as I do! Nothing beats a crispy bite sized filled bacon cup!